I trot across the snow the disc on my back was glowing,I could sense another wolf.I began to run and my paws kicked up snow-I heard the sound of rabbits scurring away. I slow down and catch my breath,I then start to walk.I stop for a momant and then howl. I hop onto a rock and return a howl,I then follow the scent to the other wolf. I trot over to the new wolf and cautisly watch him. I walk infront of the wolf "Greetings." I said. 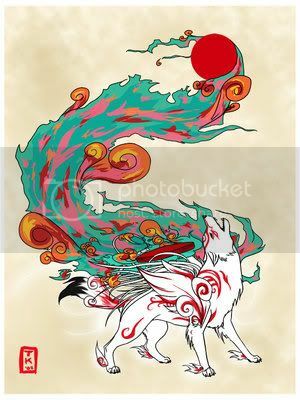 I move some snow over with my paw "I am Shiranui,who are you?" I anwsered. I smile "Nice to meet you Shadow." I replyed.